Since I am quite busy preparing my Master degree thesis, so I decided not to write too much for this post. Here I would like to share my friend Toyota Celica with twin charger system - a turbocharger and a supercharger to be exact. 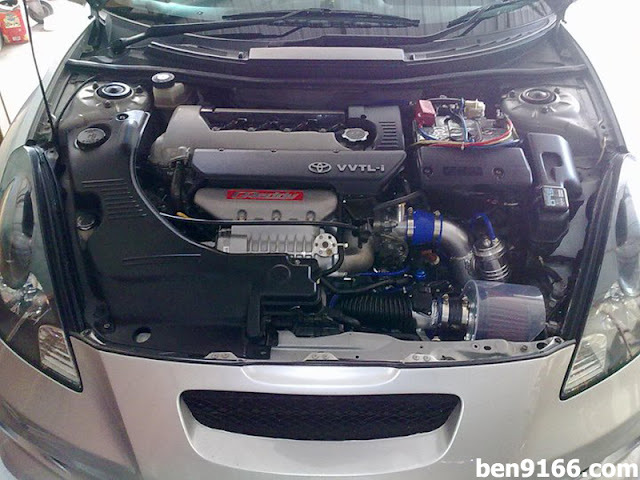 After for maybe a year or half installing the turbo kit to his Celica, finally his car is ready to run now. Too bad that I have not meet him in person to look at his new monster, but I would like to share picture and video of his car. His car is now running on a Greddy supercharger and if not mistaken with a Garrette AR series turbine as well. Still have not see his dyno chart yet but the car should be able to produce a healthy 280hp on wheel. Watch the video of his car after the jump. Enjoy!